I just purchased and installed this plane and I love it. One question, the fuel slection levers don't seem to have a "right" anything. All the levers show left & center tanks. What am I missing. This is the download version and I don't see any updates for it. 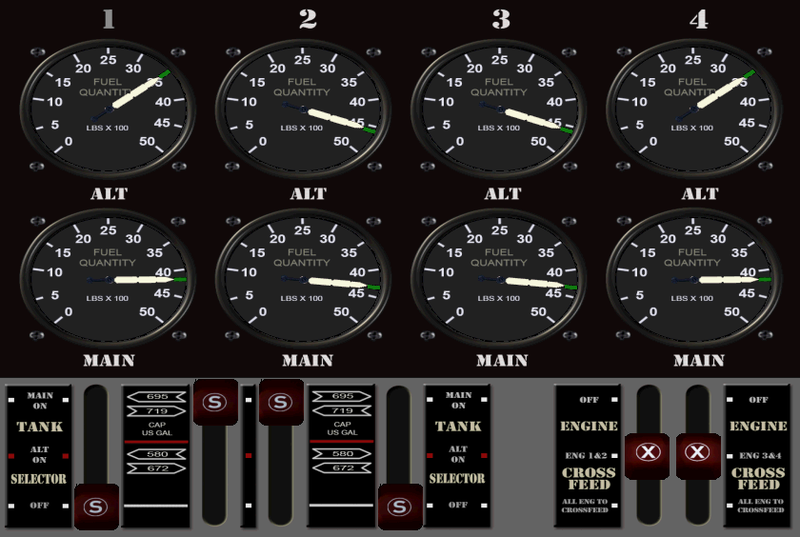 I am having a similar problem, - all left side fuel tanks are available on the left selection lever and all right side fuel tanks are available on the right lever except for the right main tank. I am unable to select the right main tank,. Thanks for the help. possible work around. I have done a couple of flights this way it seems to work. When I start the sim the fuel leaves all say "ALL" . I LEAVE THEM ALONE. They then use fuel from each tank in turn. If you move the lever you NEVER get the "ALL" postion back nor do you get a "right main". As I said has worked for the last couple of flights. Thanks Bruce I will give that a try! I want to make a "up" for this thread because we are on November , your last post is from June and nothing has been corrected by the developper??? Please JustFlight , do something for this problem , is really annoying to cannot manage the tank as it should be! And excuse me for the grammatical mistakes , I'm not english. Same problem! Not a fix yet? I can move all 4 Fueltank-Selector only in ONE DIRECTION. I have tried all "mouse techniques" to get the levers moving back from the "off"-position - no chance! So the only way is to ignore the levers after I get in the cockpit and let the default-set. An additional problem that I've found out is that I can't move the engine-selector switch back - similar problem as with the fueltank-selector. Selbes Problem, gibts noch keinen Fix? Ein ähnliches Problem betrifft den Triebwerks-Auswahlschalter. Den kann ich auch nur in 1 Richtung bewegen, also von OFF bis 4, aber nicht mehr retour, wtf? Das zerstört die ansonsten sehr gelungene Startroutine . I have recently purchased the JF DC-6B and also discovered some of these "odd" ways of invoking controls. I learned that some switches move one way on left mouse click, and the other way on a right mouse click. Others react to moving the mouse wheel. The fuel selectors respond to left/right clicks. Speaking of fuel selectors, the I think the supplied documentation does a poor job on describing fuel system management. I miss more exact information on the different settings of the selector levers, the x-feed levers, and the fuel booster pumps. The placards on the console are not easily readable. They may be authentic, but they don't describe every lever detent. thank you for the hint. I've found it myself. Now, all systems working correctly! I'm having a slightly different problem with these levers. The tooltips give me different readings for different engines, depending on whether I've got to a position by moving the levers back or forward. For example, at the start of a flight (with engines on), all four levers are fully forward and they read (1 to 4) L, R, All, All,. If I move a lever back and then forward to this position again, it becomes the cutoff position. Going from front to back on engines 1 and 2, I get (after the initial position) L tip, Aux L, L, Ctr, Ctr2, R, Aux R, R tip. This pattern seems to make sense. For engines 3 and 4, however, I get Ctr2 again for what I think should be right, and nothing gives me right. Going from back to front, engines 1 and 2 are the same except for the full-forward position being cutoff. On 3 and 4 I get two Aux R's intsead of two Ctr2's. I suspect that the readings for engines 1 and 2 are really right for all four engines, and that full forward really is cutoff, but doesn't work that way when you start. Any suggestions? I love flying this airplane, and I'll love it more when I figure out more stuff. (Just had it about a week). I have lost some of my hairs today... By making a Tank selector Gauge for the DC-6. Hey Barth.. Did you ever release the 'tank selector' gauge you talked about in your post? You folks can add me to the legion of those who have experienced disappointment with the fuel tank selection levers, an annoyance on an otherwise wonderful product. I messaged JF with this problem last night and got a reply back saying in their opinion the right-hand levers may have two "2nd Center" positions but the second position is actually for the right main tank. In other words, ignore what the tool tip says. Not too satisfactory. This has been an issue for some time now, I would have thought a fix would have come out. As it stands, I will try the "just leave the tank levers alone" solution. I would like to see Barth's add-on tank selection pop-up put out as a download but saw nothing more about it since early last year. Has anyone seen anything re: this gauge? Being disappointed with the fuel management system, as many others, I made my own fuel gauge for the JF DC-6B. It's based on the RW DC-6, with 4 fuel levers with 3 positions (MAIN-ALT-OFF) and 2 X-feed levers with 3 postions (OFF-Per side XFEED-All engines XFEED). As one may notice, this is FAR AWAY from the joke Aeroplane Heaven made of it. 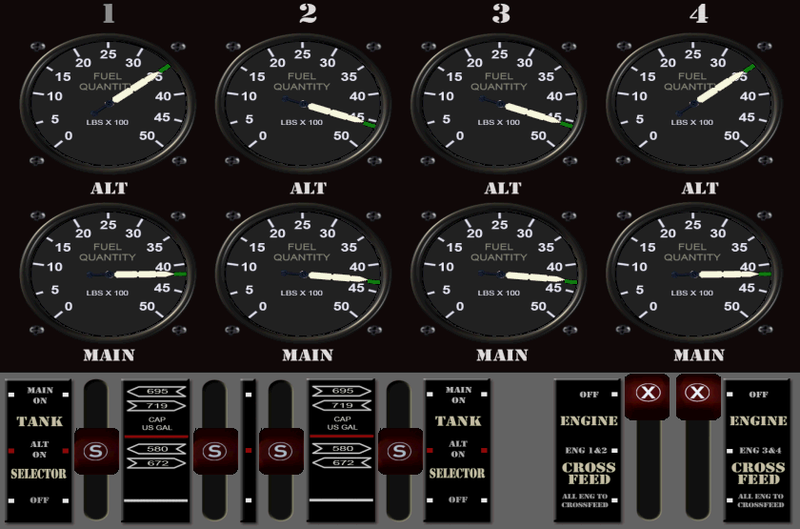 The gauge is partly finished, with the "All Engines X-Feed" yet to develop (as well as writing some kind of manual). The 1&2 - 3&4 X-feed (which is in the gauge) is really sufficient for Normal Operations, the "All Engines X-feed" only kicks in when the aircraft gets out of balance due to engine loss(es). Meanwhile, I'm looking for some testers. Please PM me if you're interested. 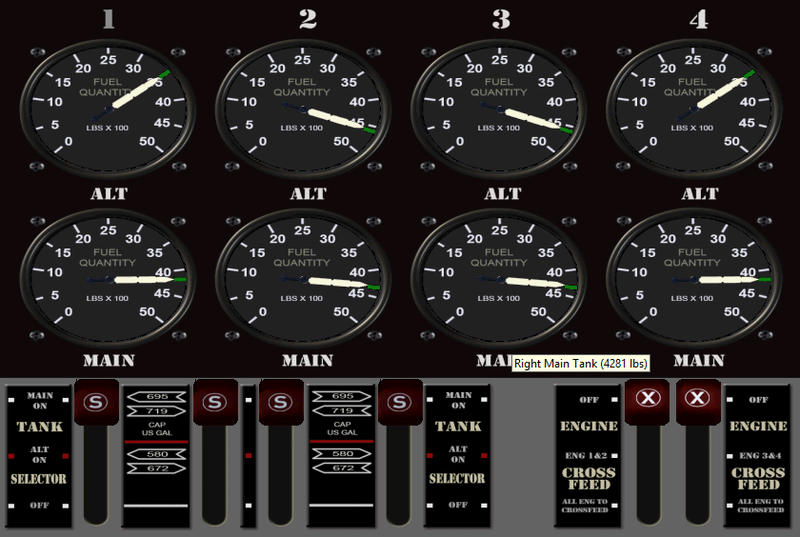 While I was at it, I also added Fuel Qty Gauges with the correct numbers. Funny nobody mentioned this flaw.